You will often be required to calculate the square area of a floor, wall, roof or similar especially when estimating and pricing up Carpentry jobs. If you need to use these formulas a lot for calculating various square areas and volumes, you could invest in a construction math calculator to speed things up. The formula and method to calculate the square area of a room like in the picture below is the same whether in centimetres, metres, feet, miles or any other measurement you need to use. All you need to do is measure the length of the room (side A) and the width of the room (call it side B), making sure you keep to the same unit of measurement for each side. Then, simply multiply the length (side A) by the width (side B). 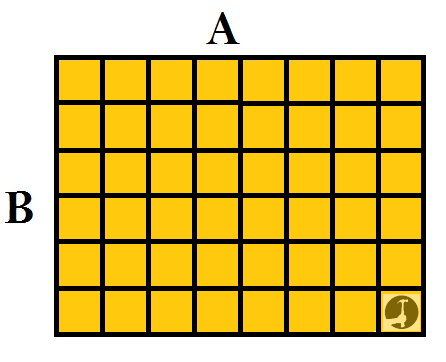 You can count all of the squares in the grid on the right, there is definitely 48! 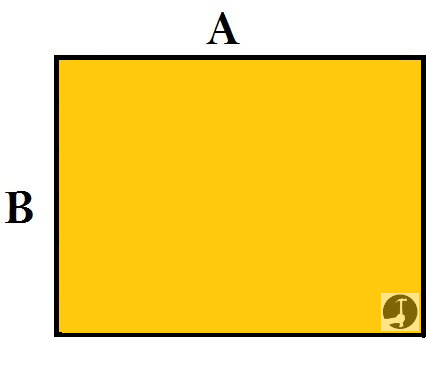 Working out the square area in metric is fairly easy because it is in decimals. There are a couple of different ways to calculate square area in feet and inches, which can require fractions instead and therefore gets more complicated. For example if a rectangle had measurement of 13'4" by 17'8", I would multiply the first number for each side by 12 which would give the total number of inches in each full foot and then add the second number to it for the absolute total number of inches in length for each side. To get a bit of a guide, we can quickly work out 13 x 17 = 221 sq feet, so we know we need to be a little more than that amount because of the extra inches involved. This means the square area is 226 square feet, plus 2/3rds exactly of another foot. Now to convert the decimal into fractions, 12 x 0.66667 = 8 inches. So our square area is 226 feet & 8 inches or 226' 8". When the room/wall/shape I want to work out the square area for isn't square but odd or L shaped like in the picture below, I separate the room into two or more manageable sections. Imagine a line separating the two sections like the red one in the picture. Then, treat these as two separate rooms and calculate the square area for both as in the first example. 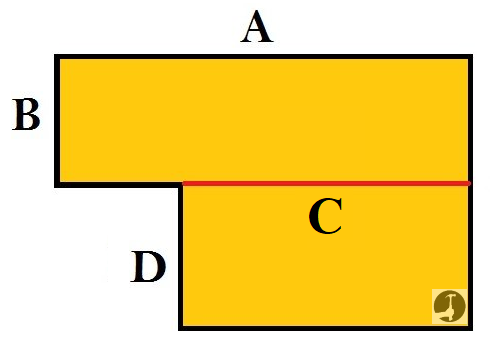 To calculate the square area of a right angle triangle, which you may need when calculating how much plywood you might need for a gable lean to roof for example, work it out the same as you would for a square or rectangle by first multiplying the length of the two sides at right angles to one another. Then divide the answer by two, because two equal triangles make up the total rectangle. 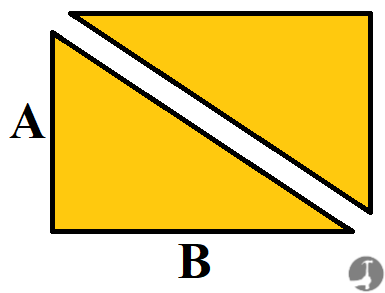 For a full gable roof, the two triangles would make up a full rectangle shape and therefore you wouldn't need to halve the measurement, the off-cut/s could potentially be flipped and used to sheet the opposite gable. Quite often as a carpenter I have needed the circle formulas information on this page to help calculate the amount of materials I need for floors for example and when forming arches for bricklayers. If you are calculating the area of a round room in order to calculate how much flooring you will need, always allow a decent amount extra because there will unfortunately be more wastage than in a square room. 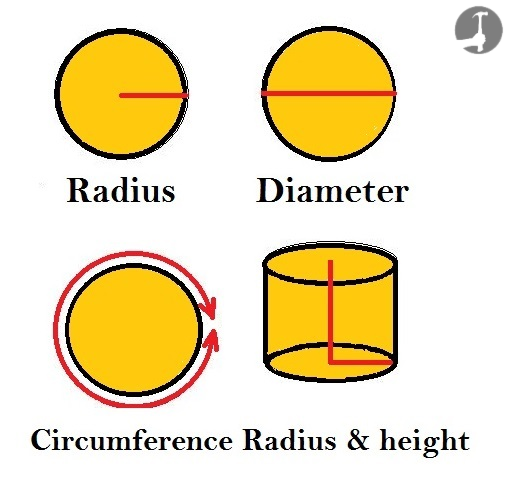 Radius = The distance from the outer edge to the centre. Diameter = The furthest distance possible across the width (twice the length of the radius). Circumference = Distance all the way round the outer edge. (I've only ever used that once to work out the length of skirting needed for a round room). When making some of the calculations a number called Pi is often needed. Pi is a decimal value, that we will simplify to 3.14 for the purpose of these calculations.